WE love our puppies and dogs & know that you do too. This page is dedicated to information to help you give them the best care possible. As a work in progress - I welcome your contributions. I am striving to provide the most natural, safe, environment and care for our dogs. I have been using essential oils and flower remedies for years, but am by no means an expert on every topic. Much of the information is based on my personal experience or that of other trusted sources. I encourage you to do your own research and come to your own conclusions. We don't limit our puppies exercise, neither do we force them - we let puppies be puppies which means they are free to play or rest when they want. They play, sleep and eat on and off throughout the day. Our puppies have access to both indoor and outdoor play areas. Outdoors they are mostly on grass with plenty of things to explore. As puppies grow they play for longer and harder periods of time (and rougher with each other) before resting. One of the (many) things that I love about our Mastadors is that they seem to naturally know know when they have had enough and its time to rest. Puppies play rough. If you don't have a playmate for your puppy - they will look to you to fulfill that need. Understanding Biting Behavior & What to Do. Your puppy does not come with vaccinations unless you request them or as noted below. Reactions to vaccines can occur and growing evidence that early vaccination can actually be very harmful to puppies. Puppies are protected by their mother's immunity. Hence repeated or "Booster Shots" are not boosting anything but only trying to vaccinate at a time when the Mother's immunity is no longer blocking the effectiveness of the vaccine. We recommend waiting until the puppy is 12 weeks old (16 weeks is even better but you need to weigh that against other risk factors) but it will be up to you to decide when and what vaccinations to give your puppy. Please read the articles below, do your own research, and discuss your options with a trusted vet. 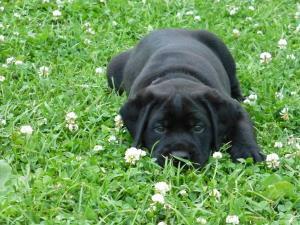 If your puppy is 12 weeks or older or is being delivered, we will vaccinate unless you ask us not to do so. Lyme Disease - What if Your Dog Tests Positive? Do Not Feed Oral Flea and Tick Preventatives. We do not remove declaws. Not only is it, in my opinion, a cruel practice, but declaws serve a vital purpose. For those who don't know, the dew claw is the dog's fifth toe that's located on the inside part of their front legs just above the foot. Dogs can have 2 dew claws on each front leg, some have them on their rear legs, but in general, most have just one on each front leg. Some people compare them to a human's thumb, but of course it isn't opposable. Historically, breeders have removed them because it gives their dog's leg a sleeker look. Some people also remove them because of the potential for injury if snagged on something while the dog is running. In the past 12 years of having active, working Labs and Mastadors, we have never had a problem with dewclaws related injuries..
Dew claws help dogs grip the ground and get better traction while running. Dew claws also help dogs grip bones or toys while chewing. There is also evidence that arthritis can be related to dewclaw removal. Critical Thinking Toys - help develop thinking and problem solving skills - like treat-dispensing balls or devices that release goodies when your puppy performs a certain task. Toy Suggestions: Large breed dogs. Puppies and adult dogs need to chew and keep busy. You can skip the store-bought snacks that are high in fat, sugar and preservatives. (I tear tiny bits off at a time). Bits of hotdog, beef liver, or other meat work well also. AVOID: rawhides, plastics, grapes, raisins, onions, chocolate and anything with caffeine or Xylitol. A stick of chewing gum contains enough Xylitol to kill a dog. These can be toxic to dogs. NylaBones can also be dangerous. Other snacks - popcorn with no salt or butter, and plain rice cakes, raw local honey, quinoi. Tomato crisps: Slice cherry or small tomatoes in half. Lay sliced side up on cookie sheet. Optional - drizzle with coconut oil, garlic, etc. Bake at 200 to 250 till crisp - approximately 12-14 hours. Pumpkins: You don't have to cook pumpkin - raw is ok, but cooking may make for more available nutrients. Preheat oven to 350F. Wash/Rinse the pumpkin. You can halve the pumpkin, remove the seeds and guts, then cook the halves. Even easier - To cook the pumpkin whole - use a knife to stab the hard outer shell a few times for ventilation. Put the whole pumpkin on a cookie sheet or shallow baking pan. Bake for 45-120 minutes depending on the size of your pumpkin. Once cooled, its easy to break or cut into manageable size pieces and remove the seeds if you want to bake them - otherwise throw the whole pumpkin in the food processor (yes - guts and all - or remove the guts becasue FYI - the guts make the best pumpkin bread EVER). You can cut into the pumpkin into pup size chunks, or puree and freeze in bags or pour in forms to make bite size treats. What to Feed Your Mastador? Why we feed and recommend L.A.
Tests every batch of food before it leaves the plant. Added benefits: Convenient autoship ordering delivered right to your door. you can start your puppy on L.A. All-Life Stages at any time. -Your puppy should be fed free choice or at least 4 times a day - as much as s/he wants to eat. Offer 6 cups a day during peak growth periods. -After six months free choice or 3 times a day - as much as s/he wants. 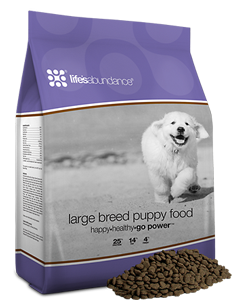 Offer at least 6+ cups a day unless overweight because limiting food during growth spurts will limit the growth potential of your puppy. -After 2 years - free choice or 2 times a day. -Mastadors can continue to grow for several years. Slow and steady growth is ideal. When to switch from puppy food to adult food? When the growth plates are sealed. For Mastadors usually between 20 months and 2 years. Some signs that it is time is if the puppy no longer seems interested. - Good Nutrition is essential for good health. 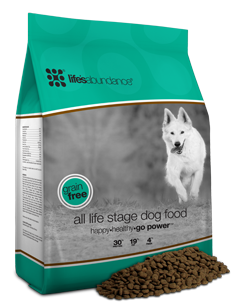 - ​My number one recommendation for food is L.A. All Stage Dog Food or Large Breed Puppy Food. 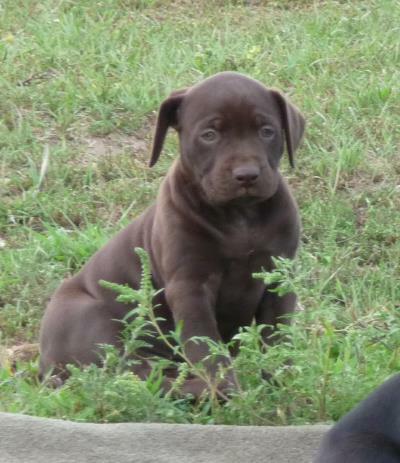 - Your puppy will be eating free choice L.A. Large Breed Puppy Food (order here). Please continue with that same food. I recommend you keep your puppy on the same food, but if you switch your puppy's food - do so only after they are well settled - do so gradually over the course of several weeks. Start by adding 1/4 of the portion of the new food and gradually increase the ratio. -Puppy Mash: Your puppy will be also be getting puppy mash 2 to 3x a day (first thing in the morning and last thing at night) . To make puppy mash - put the dry Puppy food in a blender with hot water, powdered all species milk replacer, (or canned evaporated milk or goat's milk) and optional - egg yolks (or whole cooked eggs) (2 parts liquid to 1 part dry food (for one puppy an 8 oz can would last 2-3 days). It is a good idea to continue with puppy mash for a few weeks to help your puppy transition to his/her new home and continue on track with growth. You can blend more than one feeding at a time - be sure to refrigerate unused portion and any opened cans of milk. As it sits it will get firmer - add hot water to thin it and warm it up right before serving. If using cooked eggs - you can crumble the egg on top of the mash. * Instead You can use milk replacer made for Goats and puppies. You can find powdered Advance, or MannaPro Unimilk at Tractor Supply, Walmart, or MIlls Fleet Farm. Their 3.5 lb bag is around $11 at Walmart. Make sure that you are not feeding your dog treats or foods containing the sweetener Xylitol which now can be found in some peanutbutters and many chewing gums. (If you are feeding a grain free diet and your dog has food allergies try switching to a food that has no soy fed chicken or chicken meal. Glycerin can also be a culprit. Another consideration is the amount of carbohydrates or starches/hidden sugars. Even most grain free foods have too much starch. To calculate: 100 - (Protein + Fat + Moisture + Ash (use 7% is not listed) = % of carbohydrate. High quality organic food free from high content of grains, GMOs, preservatives, etc. If you are going to feed purchased BARF/SARF or dry or wet kibble, feed a high quality 4.5 to 5 star food that has not had any recalls. Please note that some Grain Free foods can cause loose stools. Puppies natuarally avoid messing in their bed. Their Mom does clean-up for the first several weeks. At 3 weeks, puppies start climbing out of bed to potty. This is when we provide potty pads/grass turf and pine shavings and start the potty training process. Their bedding has to be kept very very clean and because accidents happen on a regular basis that means a whole lot of laundry for me. As the puppies get more mobile, the potty pads/turf and shavings are moved closer to the door. 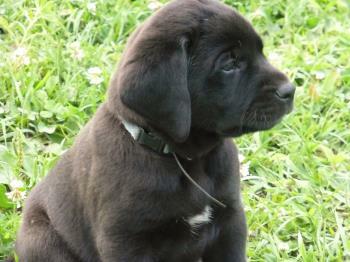 Weather permitting, the puppies are allowed to use a doggie door at around 4-5 weeks. 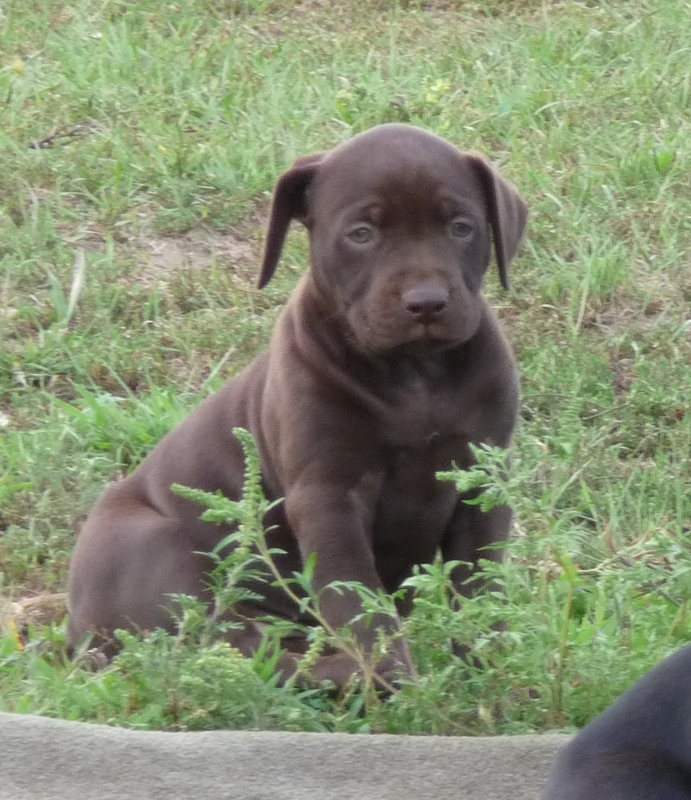 By the time you get your puppy at 8 weeks they are well on thier way to being house trained. Puppies need to potty as soon as they wake up, right after they eat, after heavy playtime, if you see them sniffing around. in general - every few hours. There are different methods of training - crate, tether, clicker. Mostly you just need to pay attention to your puppy. Its best to work on crating during the day starting with leaving the door open and feeding the puppy in the crate, a place for special toys and naps. Once your puppy is relaxed and happy with the crate, you can start closing the door for short periods of time. Until you get your puppy, that puppy has only known life with its Mother, many litter-mates, and other dogs in my household. Then they get to your new home and feel isolated, alone and vulnerable. Puppies need deep, restful sleep for growing and good health. If you have another dog - your new puppy will sleep best closest to another dog, or If you intend to let your puppy sleep in bed with you once it's potty trained - there is no need to wait. Puppies don't potty in their bed unless an emergency. My experience has been with the puppies that I have potty trained, that they will sleep most of the night, maybe needing to go out once. If they need to go - they pace the edge of the bed and whimper, or will otherwise wake me up. Until puppies get the hang of night-time potty - its best to carry them outside. 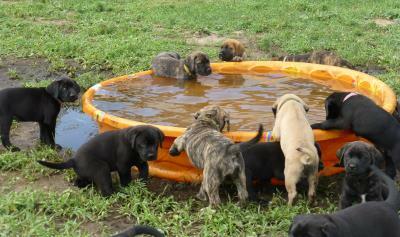 Have a water bowl outside also so they can get a drink if needed. Once back in bed with lights out, puppy usually will go right back to sleep. I also have a few toys for the puppy in bed so if they wake up before I do and don't have to potty, they will keep themselves entertained. It is also important that they have their own special place to rest and be comfortable for those times when you don't want them on the bed, whether that be a crate or special dog bed. A dog's coat needs its natural oils to remain soft and silky and to keep from getting brittle or damaged. If you bathe your dog too often (every week, for example), you will strip away those oils. A good rule of thumb is to only bathe your dog when noticeably dirty or smelly. It's Imprtant to use organic shampoos with ingredients that are not harmful to your puppy. I don't typically use crates other than an open door dark space for our dogs to sleep in if they choose. They are more likely found on my bed or couch, stretched out on the floor, or on one of the numerous dog beds scattered throughout the house. That being said - Crate training is a good idea in small doses and as an aid in potty training if needed. If you can be vigilant and take your pup outside before there are any accidents in the house - within a few days to a week your puppy should be house trained to a large extent. (I use the words - "go potty" and then praise when they do). Please keep in mind that your puppy will not have good bladder and bowel control until they are 4 to 5 months old. Please do not limit your puppy's water intake as a method for potty training as is is very imprtant for your puppy to stay hydrated at all times. Limiting water intake can cause severe health problems. Include some comfortable bedding that is at least somewhat chew resistant, (I love the Puppy Culture Yak beds because they are durable, washable, very thick and soft and have no stuffing to pull out!) (or you can use the fleece kennel beds) a blanket and a few favorite toys. Make sure that the crate is not too hot for your puppy. If you have two puppies, you can crate them together in one crate. Crate training will be much easier and everyone wil be much happier. from 46 to 68 inches from nose to base of tail and up to 44 inches from floor to top of head when sitting. A lot of puppies get carsick when they're little and most of them grow out of it but sometimes just the stress of that memory of getting sick (or a stressful or bad experiecne - ie to the vet for shots) will trigger stress which then triggers car sickness or unwillingness to go. Once you get them liking the car - good luck trying to keep them out of it - lol. Make the car ride the best experience of their life. Use Positive reinforcement. Offer Their favorite food in the world (and praise in an encouraging voice) at any trouble spots. So if the problem is just getting from the house to the car. You would offer it for them to come to the car or if you can only get halfway then at the halfway point gradually working up to getting to the car. Same with getting in the car and relaxing in the car. Just spend some time hanging out in the car without moving with favorite food and toys etc. get them consistent happiness/willingness before you move onto the next step. Might take a few days or a week or more. From there you can go to the end of the driveway or around the block then maybe to Mickey D's for a dollar cheeseburger, Puppicino at Starbucks, PupCone at Dairy Queen, or ... (well you get the idea. The Park, Beach or somewhere else fun. Short distances at first. 2. Increase the intensity of the activity by baby-steps - as long as your dog continues to remain calm. If they are acting stressed, unwilling, or scared through their behavior, body language or vocalization - go back to where they can comfortably tolerate the intensity of the stimuli. It may take time to complete these steps depending on your dog’s history and willingness. Have patience and let it take as long as it needs to take, whether that be hours, days, weeks, or more.